USD/JPY trades around 110.65 ahead of European markets open on Wednesday. The pair remains well passed the seven-week high and follows short-term ascending trend-channel. 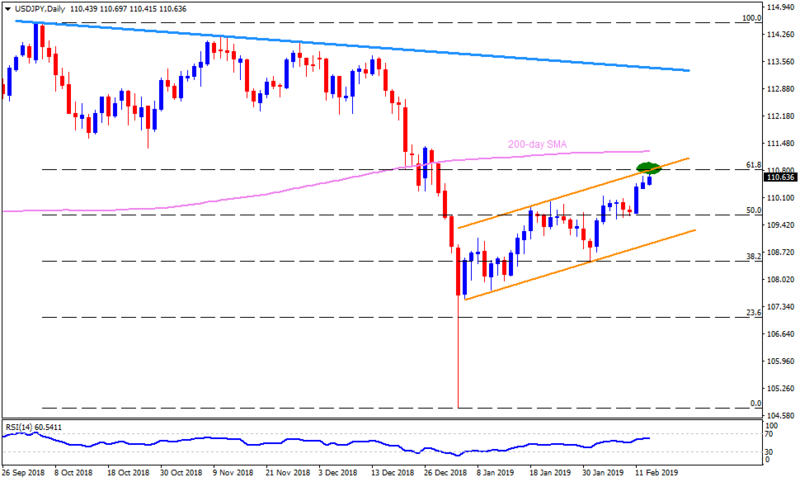 However, the resistance line of the channel formation and 61.8% Fibonacci retracement of October to January decline, at 110.80, can challenge recent upside momentum. Hence, buyers need to conquer the 110.80 mark on a daily closing basis prior to confronting the 200-day SMA level of 111.30 and October month low near 111.40. Should there be a pullback, 110.30 and 110.00 could offer immediate support, a break of which drag the quote to 109.80 and 109.10. During the pair’s extended downturn under 109.10, support-line of the channel, at 108.90, may become sellers’ favorite as it holds the gate for the pair’s drop to 108.50 and 108.00 supports.